As it would happen, I love telling stories. Lucky for me, so does my friend, local film director Michael Holder. “What the heck,” we said one evening when we’d had a glass or two or three of wine. Why not do more of what Epi-Ventures already does … and tell stories about food through video? And just like that … Epi Entertainment was full throttle ahead. The recipe I made above is Sticky Asian Chicken Wings. (I’ve written about it before here.) It’s embarrassingly easy to make. If you can measure and stir, you’ll be licking your fingers in no time. But chicken wings are just the beginning here, as I hope you will see. Aside from showcasing fun recipes, we’re producing a new video series called Cincinnati Deconstructed. It will highlight people here in the city that make food so fascinating. Some faces you’ll know … others you won’t. I think it’ll show you things in a whole new way. I hope it will inspire you. So without further ado, grab a whisk and some balsamic vinegar. Pour out some sugar. New things are on the horizon. And wings are on the way. Combine the balsamic, honey, brown sugar, soy sauce, rosemary sprigs, and garlic cloves, in a mixing bowl — then add the chicken drumsticks and marinate for 2 hours. Preheat the oven to 450 degrees. Place the drumsticks on a foil-lined baking sheet and bake until the skin is caramelized, about 30 to 35 minutes. Place the marinade in a small saucepan and bring to a boil to kill the bacteria. Reduce the heat to simmer and cook over low until thick, about 15 minutes. Reserve. Use a pastry brush to paint the marinade on the cooked chicken and finish with a sprinkle of sesame seeds and chopped parsley. Love it! 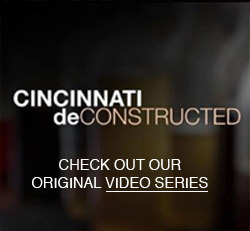 Looking forward to seeing the Cincinnati Deconstructed series. This is great – can’t wait to see what you will post next! Amazing. And i’m not just talkin bout the wings. Very very very cool. Makes me want to make these (and devour them) in a way just the printed recipe doesn’t fully showcase. Confession – i watched it twice. Ok, three times. More more more!!!! Thanks Loren – it’s small but it’s all we need! You probably know me better as L.R. Ben did a nice job on that kitchen. Wow – that’s like, a mind blower. L.R. – too funny. Between Ben and the fact you work for Jeff Eberlein, we have our own Kevin Bacon thing going on. We should probably cook together some time! I’m so happy to see that house in the hands of people who appreciate the kitchen! Now I can stalk it via your videos. You know it… I would if I were you! i want those wings!! and i love the video…but i love the idea of eating those wings more..or do i ?! i don’t know! super fantastic guys!!! Nice work! Looking forward to seeing what’s next! and now I want wings. For breakfast. And I blame you. Love the video, very cool to see the cooking process in action. The camera style reminded me a bit of the Food Network show ‘Good Eats’ but without the plot gimmicks and actors. Looks like Michael’s dog (assuming it’s his) is infatuated with the wings just like I am! Ha – thanks Cal. That’s my dog – she’s infatuated with eating anything edible and non edible, including remote controls, wires and scraps of paper.